August Webinar: What’s Your Education Plan? 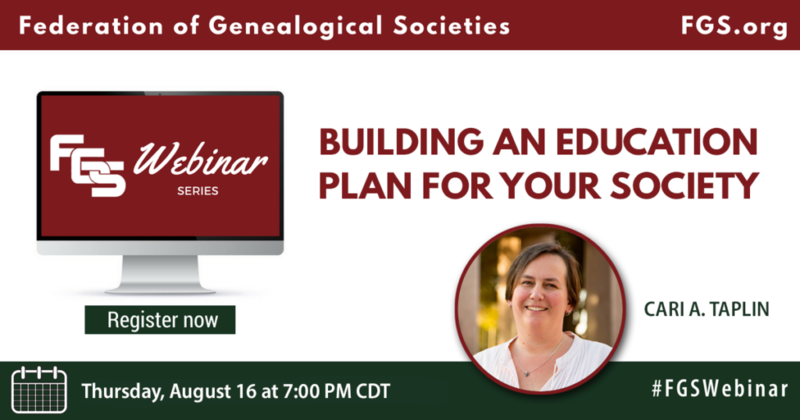 The Federation of Genealogical Societies (FGS) is pleased to announce the August 2018 webinar, “Building an Education Plan for Your Society,” presented by Cari A. Taplin. Most genealogical societies foster education in the field of genealogy. Having an education program outside of the monthly meeting can build membership, develop volunteer relationships, and give greater educational opportunities to members. This lecture will share ideas on developing a strong education program for societies. This webinar will be held on Thursday, August 16, 2018, at 7:00 p.m. Central Time, and will be recorded for viewing on the FGS website shortly after its conclusion. Please register in advance. Cari A. Taplin is related to Roy Rogers. Or at least that’s what her family told her. As a result, finding her true heritage has been her focus since the year 2000. She is a native of Wood County, Ohio, but migrated to Wyoming, Colorado, and now Pflugerville, Texas, near Austin. Cari holds the Certified Genealogist® credential and has served in a wide variety of volunteer and leadership positions for state, local, and national societies. She currently serves on the boards of the Association for Professional Genealogists and the Federation of Genealogical Societies. As the owner of GenealogyPANTS, she provides speaking, research, and consultation services. Cari focuses on Midwestern and Great Lakes states, and methodology. When she’s not working on her genealogy, she is a wife and mother of two teenagers. Each month, the FGS Webinar Series features a new and interesting topic, ranging from recruitment and volunteer management to technology, publications, and working with your local tourism board. Webinars are held on the 3rd Thursday of the month at 7:00 p.m. Central Time. The webinars are free to watch live, but advance registration is required. Regular updates will be shared via the FGS Voice blog, FGS Voice Newsletter, and social media. Speakers interested in presenting topics should contact Jen Baldwin, Education Chair, at education@fgs.org. Are you looking for a rewarding and beneficial way to volunteer? The Education Committee at FGS could use your expertise! Please contact us at education@fgs.org.